With thanks from The Redcafe. 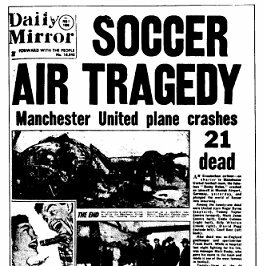 This is a history of the events leading up to, including and following the tragedy of Thursday February 6, 1958 in which 23 people connected with the Manchester United British football team lost there lives. Events that molded Manchester United into the football club it is today. 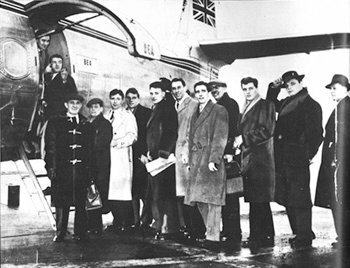 Players, officials and journalists prepare to board the BEA Elizabethan, which was to crash at Munich. The aircraft stopped at the snowbound German airport to refuel as the party made its way back to England from Yugoslavia. The team Matt Busby had built from the club's successful youth policy seemed destined to dominate football for many years. Such was the power of the Babes that they seemed invincible. The average age of the side which won the Championship in 1955-56 was just 22, the youngest ever to achieve such a feat. A year when they were Champions again, nothing, it seemed, would prevent the young braves of Manchester United from reigning for the next decade. United had taken their first steps into European football in defiance of the football authorities and it was on foreign soil that the final chapter in the story of the Babes was to be written. 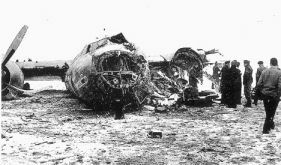 The aircraft carrying the United party back from a victorious visit to Yugoslavia crashed in the snow of Munich airport and the Babes were no more. The young Champions flew out of Manchester to face Red Star Belgrade remembering the cheers of 63,000 intoxicated football fans. Five days before Munich, United had played Arsenal at Highbury and thrilled all those who witnessed that game with a display of the attacking football that they had made their trademark. Nine goals were scored ... four by Arsenal, five by United. That game, on Saturday, 1 February 1958, had typified the Busby Babes. They played with such flair and enthusiasm that they thought nothing of conceding four goals in their efforts to score five. United were trying to win the League Championship for the third successive season and by then had already reached the fifth round of the FA Cup. To set the scene for the tragedy, which was to shock football, let us consider how the 1957-58 led up to a symbolic game with Arsenal and the fateful journey to Yugoslavia. For United, the season had started well, victories over Leicester at Filbert Street, then Everton and Manchester City at Old Trafford being the perfect launch towards the title. Their scoring record was remarkable with 22 goals coming in the opening six games. Yet when they lost for the first time it was not by just an odd goal, but by 4:0 at Burnden Park, where Bolton Wanderers ran rampant in front of a crowd of 48,003. As 1957 drew to an end the Babes lost 1-0 to Chelsea at Old Trafford, then picked themselves up to beat luckless Leicester 4-0. On Christmas Day goals from Charlton, Edwards and Taylor secured two points against Luton in Manchester. On Boxing Day they met Luton again at Kenilworth Road and drew 2-2 and two days later the `derby' game with Manchester City ended in the same scoreline at Maine Road. A crowd of 70,483 watched that game as the old rivals battled for pride as well as points. As the European Cup-tie with Red Star approached, the side also made progress in the FA Cup with a 3-1 win at Workington and a 2-0 victory over Ipswich at Old Trafford to see them through to the fifth round, where they were to meet Sheffield Wednesday. But the third target for Matt Busby, success in Europe, was perhaps the greatest. In 1956 United had become the first English club to compete in the European Champions' Cup, falling at the semi-final to the might of Real Madrid, winners of the trophy in the competition's first five years. That year, the European seed had been sown. Manchester had witnessed the skills of di Stefano, Kopa and Gento, had seen United score ten times against Belgian club Anderlecht, then hang on against Borussia Dortmund before a remarkable quarter-final against Atletico Bilbao. In this match the Babes defied the odds by turning a 5-3 deficit from the first leg into a 6-5 victory, with goals from Taylor, Viollet and Johnny Berry, to win the right to challenge Real Madrid in the penultimate round. That was where the run ended, but when United qualified to enter the European competition again in the 1957-58 season it was clear where the club's priorities lay. Matt Busby wanted a side that was good enough to win everything. The FA Cup had been snatched out of his grasp because of an injury to goalkeeper Ray Wood in the 1957 final, but his Babes were capable of reaching Wembley once again. Having secured the League Championship in 1956 and 1957 they could certainly emulate the great side of pre-war Huddersfield Town and Arsenal and win it for a third successive time. United's second European campaign saw them stride over Irish champions Shamrock Rovers before beating Dukla Prague 3:1 on aggregate to reach the quarter-final against Red Star. The Yugoslavs came to Manchester on 14 January 1958, and played a United side which smarting from a 1:1 draw at Elland Road against Leeds United, who had been beaten 5:0 at Old Trafford earlier in the season. Bobby Charlton and Eddie Colman scored the goals that gave United the edge in a 2:1 first leg victory over Red Star, but it would be close in Belgrade. The run-up to the second leg was encouraging. A 7:2 win over Bolton, with goals from Bobby Charlton (3), Dennis Viollet (2), Duncan Edwards and Albert Scanlon, was just the result United needed before visiting Highbury, then leaving on the tiring journey behind the Iron Curtain.